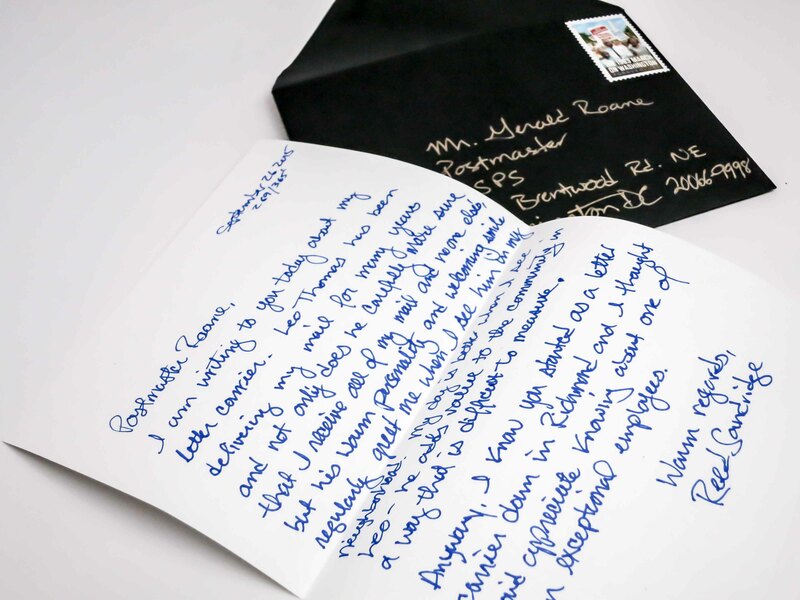 This is my third letter to U.S. Postmaster General Megan Brennan. I also wrote to her on Day 51 and Day 135. 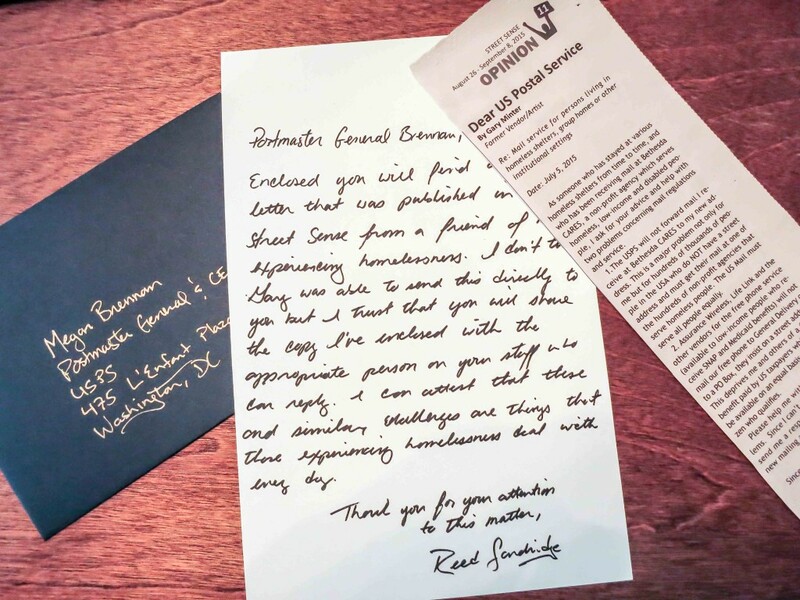 For an organization whose passion is mail – I can’t say that I’m impressed with their ability to respond to mail sent to them. I never received any responses from my two previous letters and I probably wont receive one to this one either – and frankly I don’t care. I’d just be happy if she or someone on her team responds to Gary Minter. Gary is the man who I wrote to on Day 260. I was touched by his open letter to the USPS that was published in Street Sense about the challenges he faces due to his housing status. 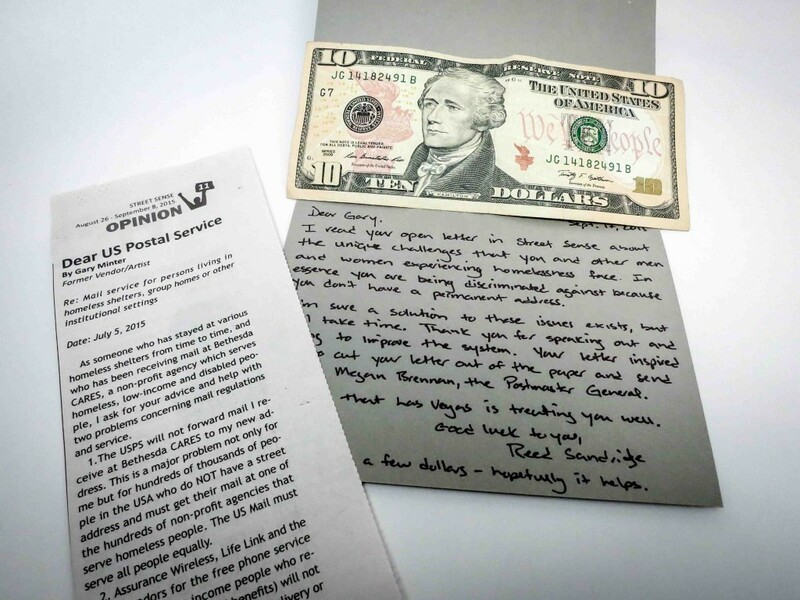 It’s my hope that Gary gets a thoughtful responses from someone at the Post Office. Enclosed you will find an open letter that was published in Street Sense from a friend of mine experiencing homelessness. I don’t think Gary was able to send this letter directly to you but I trust that you will share it with the appropriate person on your staff who can reply. I can attest that these and similar challenges are things that those experiencing homelessness deal with every day. Actor and activist Danny Glover was the recipient of my letter yesterday. Glover, whose parents and brother worked for the U.S. 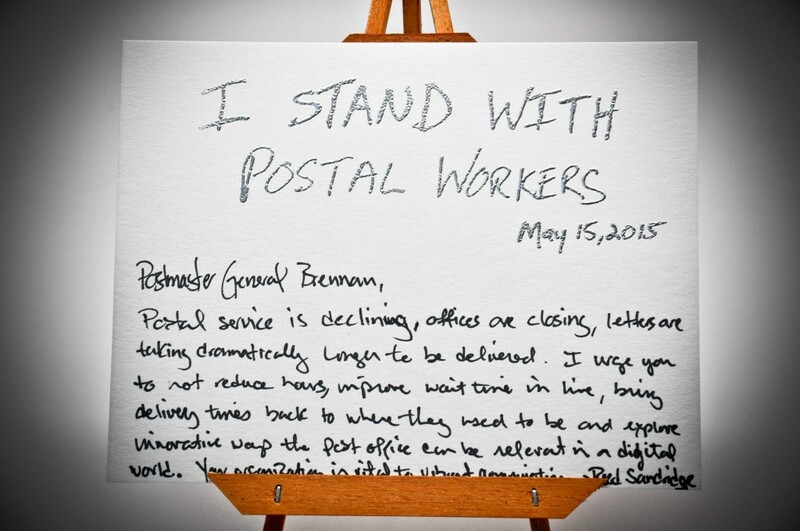 Postal Service, was here in D.C. to encourage people to stand up for postal workers. So today I thought I’d do just that. This is my second letter to Postmaster Megan Brennan – my first one was on Day 51. 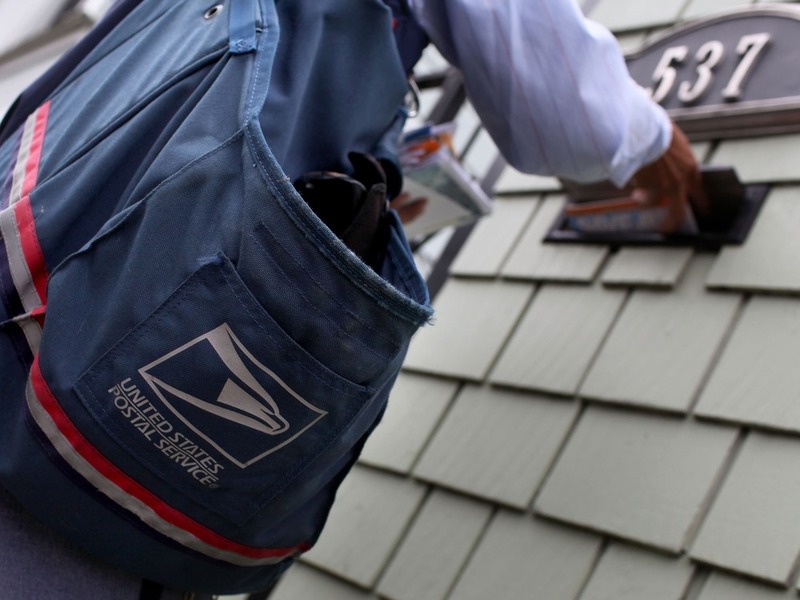 Postal service is declining, offices are closing, letters are taking dramatically longer to be delivered. I urge you to not reduce hours, improve wait time in line, bring delivery times back to where they used to be and explore innovative ways the post office can be relevant in a digital world. Your organization is vital to vibrant communities. 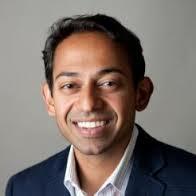 I met Kiran at an event last October here in Washington, D.C. He’s the co-founder of Arcadia Power, a business and residential utility provider that invests in clean energy. In addition to his entrepreneurial ventures, I learned that he had authored a book about a healthcare pioneer from the mountains of Eastern Kentucky where he grew up. He mentioned a place called Greasy Creek – which was not unfamiliar to my ears. My mother, who grew up in the coal-mining hills of Virginia’s panhandle, used to talk about Greasy Creek. I thought for a moment that it was the same place, but I now know that it’s not. Kiran told me about how a woman named Eula Hall overcame tremendous challenges to establish a much-needed health clinic in the area. He talked of the miners, the poverty and the isolation from the rest of the country. And while he was talking about Kentucky and not Virginia, the land and the people sounded the same. 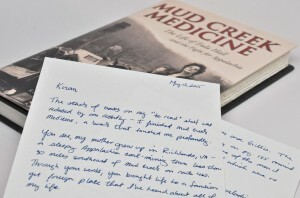 I read Mud Creek Medicine and thoroughly enjoyed it. If you are interested in that part of the country, have family from there or have just driven through, you will identify with Eula’s story. And if you don’t have a connection to Appalachia, all the more reason you should read it. The story that Kiran shares is quintessential to a part of America that seldom finds its way into the minds of people in New York, Chicago or Los Angeles. The stack of books on my “to read” shelf was reduced by one recently. 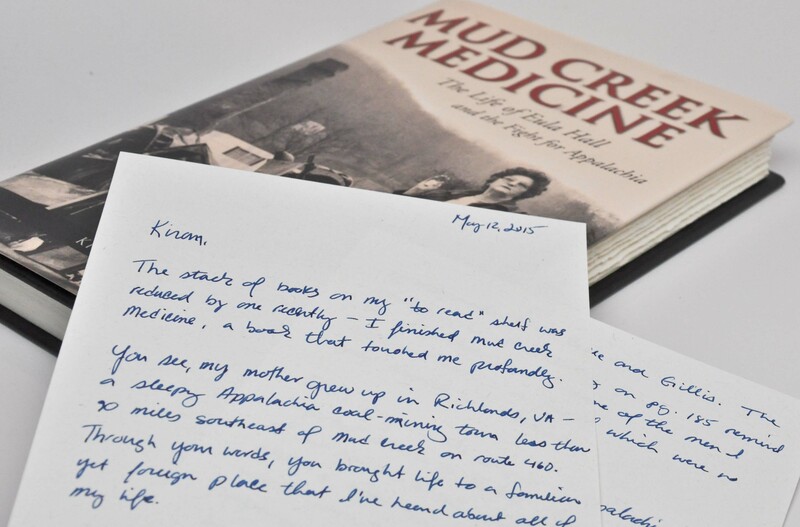 I finished reading Mud Creek Medicine – a book that touched me profoundly. You see, my mother grew up in Richlands, VA – a sleepy Appalachia coal-mining town less than 90 miles southeast of Mud Creek on route 460. Through your words, you brought life a familiar yet foreign place that I’ve heard about all my life. One of six children, my mother grew up the daughter of a coal-miner. 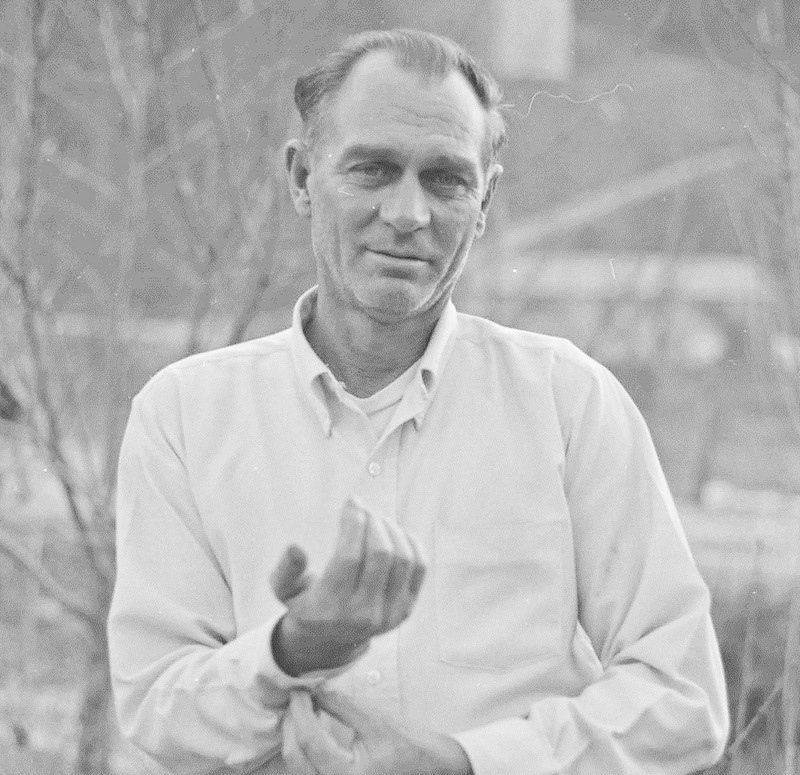 Her relatives were a cast of colorful characters right out of Mud Creek Medicine who lived “down in the hollers”, “around the bend” or “over the bluff” in Tazewell County. I grew up listening to stories of my mother’s aunts Carmie and Okie and uncles Ralph, Byrd, Ulys, Trinkle, Otis and many others. And of course my grandparents Flora Belle and Gillis. The photographs of McKinley on page 185 remind me of photographs of some of the men I mentioned above – a few of which were no-good drunks like McKinley. 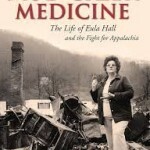 Eula’s story and the struggles of Appalachia are important stories to be told – they go to the quick of our nation. Eula’s stubborn commitment to make a difference in a time and a place where women weren’t welcomed to do such a thing is inspiring. Thank you for telling her story so beautifully. P.S. I’d love to get together for coffee or a beer sometime, talk about the book and get you to sign my copy. 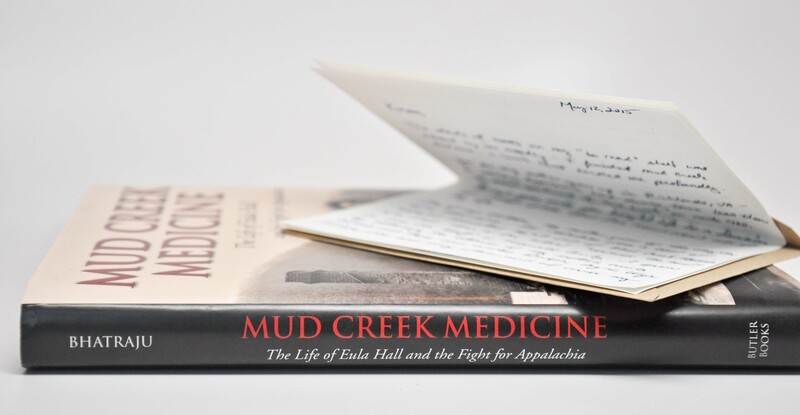 Mud Creek Medicine is available on Amazon.